The past three days we cycled from the Western Czech Republic in Bohemia to the East Moravian town of Mikulov, closely following bike routes along the Austrian border. their own people behind the barriers. By the third day of riding near the border, the bunkers and castles and look-out towers had become so commonplace they barely warranted a mention as we pedaled east. Before history and international committees designated this line as the current border between the Czech Republic and Austria, this region was the boundary between the kingdoms of Bohemia, Moravia and Austria. Today castles stand guard at the old borders, built and expanded and renovated as they changed hands as the ruling families intermarried and then died off over the centuries. Each generation building their new fortifications and palaces to mark their territories. And rule their serfs. Collect their taxes. And defend what their entitlement. This borderland was also central in the early efforts to challenge the Catholic Church when the Hussites broke from the church with their own vision of religion, forming an army that eventually disintegrated into basic looting and marauding. They sacked towns in the region in the name of God and wealth. Earlier this week we saw a painting of a beautiful chateau surrounded by elaborate gardens displayed over a mantle at the massive castle at Cesky Krumlov. We asked the guide the location, and he told us not to visit. There are now more chateaus and palaces and castles than the state can manage, so they have resorted to using many of them for alcoholic treatment facilities to fill a very different modern need. 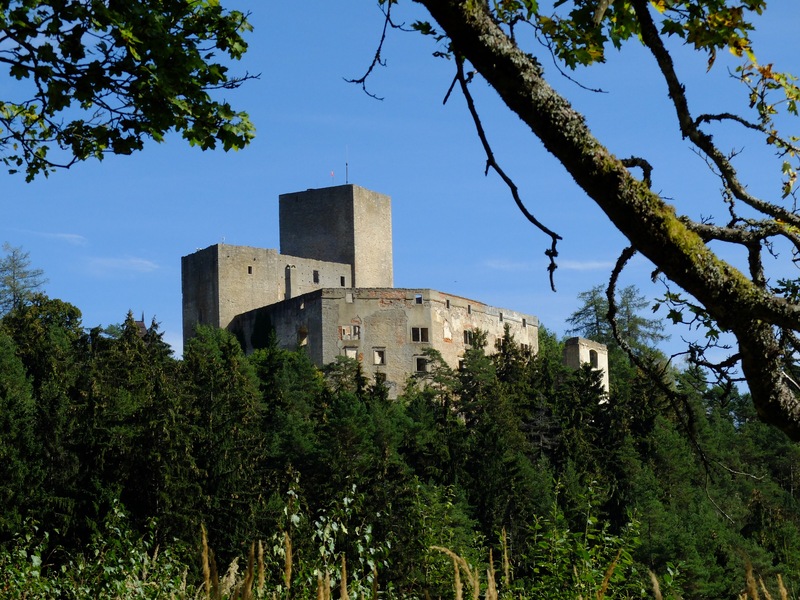 But while today the old castles and palaces perched on hilltops seem like they fell from a fantasy story as we cycle in their shadow, their modern counterparts tell a grimmer tale that is still to fresh to be romanticized. The first 1930’s military bunker I noticed riding east was close to Slavovice, a small community in the south where many artists fled to escape the notice of the communist government mid-century. Soon the bunkers were popping out of the ground “like pimples on the landscape”, to quote my ride buddy Julie. They erupt from the large fields, some still with watch towers on the top. Many overgrown with trees. Many still painted in multicolored camouflage. Once I learned to recognize them, I saw them everywhere. 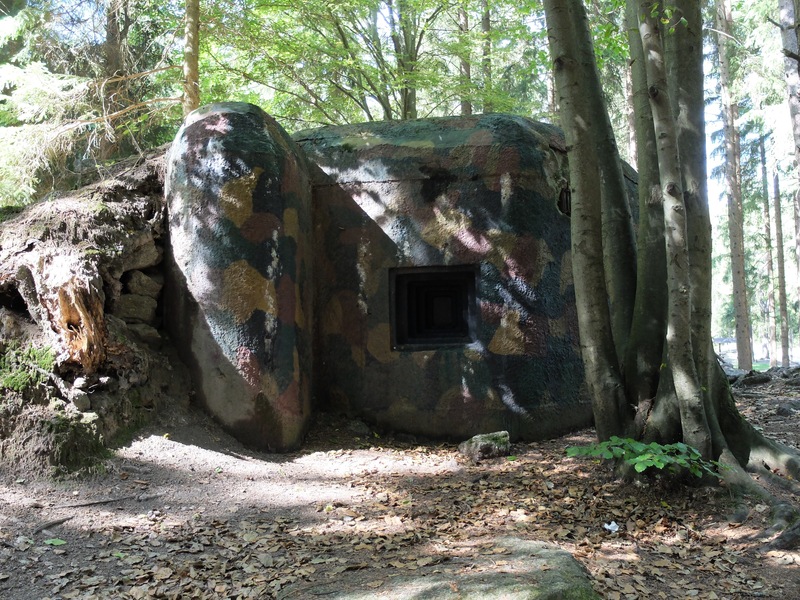 These bunkers were built before WWII, when Hitler’s party had won the elections in CZ, and Hitler was laying the groundwork for his expansion. The western border between CZ and Germany was one of his first conquests, gifted by the allies who tried to appease him. The remnants of the fence that formed the Iron Curtain also still exists, though only in a small section outside a tiny village. 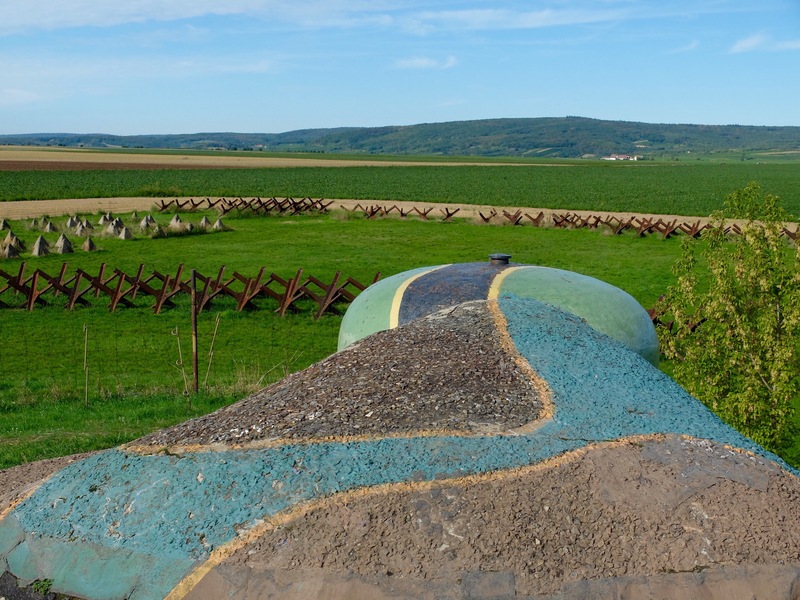 This memorial leaves the remnants of the gate and anti-tank barriers and barbed wire electrified fence and tall watchtower intact, so it’s easy to imagine that fence stretching like a black scar cutting hundreds of kilometers across the green hills. 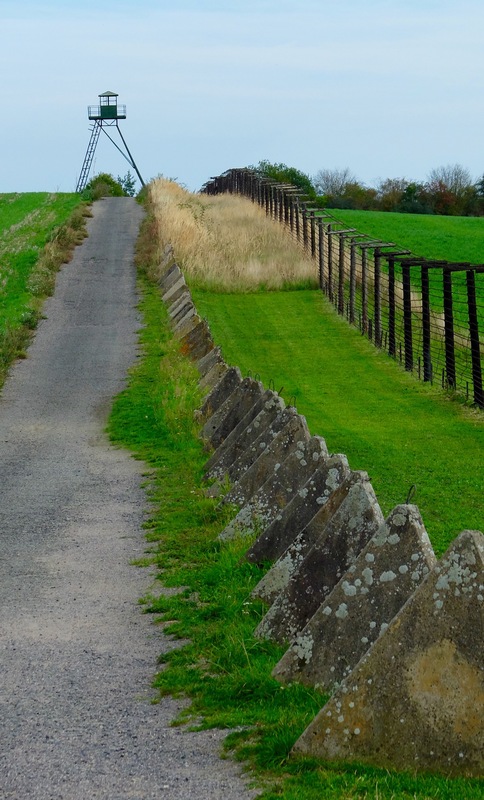 The more subtle remnants of the iron curtain – the long straight roads to patrol the no-man’s land on the border – are now popular bike and recreational trails. They stretch in long, straight lines east to west paralleling the border. The villages here were removed and residents relocated, leaving behind barren stretches of one-lane patrol roads… creating a monotonous path across a country which has been anything but monotonous until now. As we cycled many miles of these patrol roads turned bike trails today, I found the landscape grim in a land that so far has been full of beauty and life. I hope the thousand years of strife that left this borderland covered in sentinels is over. But I have to wonder if a border that has been so disputed will ever be left at peace. And how the next generation of sentinels will leave their mark this beautiful land.